The basic premise is exactly the same. Vertical runners (or Nutter-bars, as my wife came to refer to them when they were cut, stained, and laid out drying in pairs) are secured to the wall over the studs with large drywall screws in each notch for a total of 54 screws. 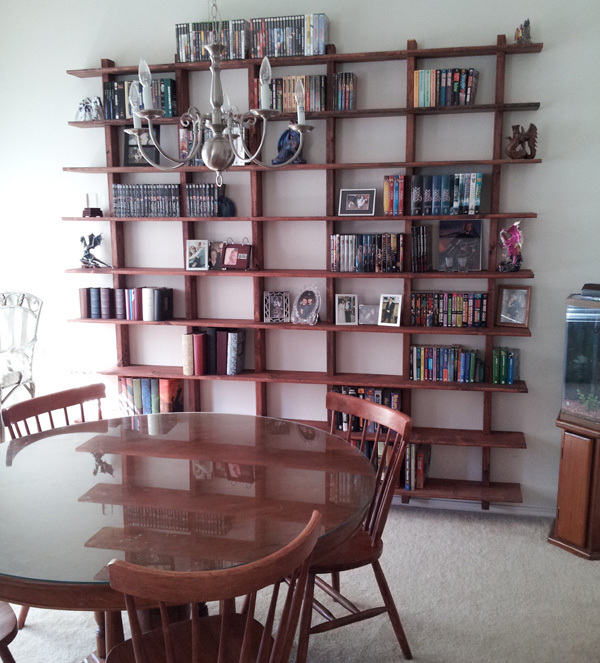 I used 2×4’s for the vertical pieces this time as they were cheaper and provided more than enough support for the shelves. Notching the verticals with a circular saw was a bit of a pain at first. Nibbling away the middle of the notch after a cut on either side with a saw blade is clunky and time-consuming. About 25 notches in, I discovered just doing a cut with the circ-saw on either side then knocking out the bit in between with a chisel was faster, much easier, and better for the saw. The shelves themselves measured eleven inches deep and eight feet across except for the upper two which are six inches deep. This wasn’t a design factor but more of a “use what I had on hand” decision. Most of the furniture in my place is dark, so I chose to throw a good coat of oil-based stain on them before the install. The color turned out about perfect. I’d have used a system other than standard Minwax, but I didn’t know of anything other than paint that would one-shot pine the dark red I was looking for. After a week of drying time in the garage (Minwax stinks to high heaven and the smell takes a while to dissipate), the shelves were installed and looking good in about two hours. No sooner had I finished shimming them up with carpenter’s shims than we had them halfway loaded with stuff. This really is a pretty forgiving project, even for beginners, and we would recommend it to anyone looking to build cheap, effective shelving. After seeing last year’s post, I personally started planning an amalgamation of these shelves with built-in desks for my kids. I attached all verticals to studs with 3″ framing screws via pre-drilled holes in the notches. I too had issues with the skill-saw notching and came up with the EXACT same workaround Sean did. Man, did that save time and elbow grease. My son’s room was first. This was all done with pine 2×3 furring strips (that I wasted hours sanding down to save $.75/board) and 1×10 shelves with a 24x72x1 desk. All was sanded and most was slapped with some poly to darken the pine, though the desk was finished properly. I can’t believe cheap shims hold this stuff up. Granted I put 1 kicker on the desk corner not butted-up in the room’s corner, but that’s it. The shelves can almost be climbed on. For the mistakes I made, you’ll never see them and my son quadrupled his storage. When I tackled my daughters room we painted the “nutter-bars” the same color as the walls and used two desk kickers. This time I ripped 2x4s down to 2×3.25s so they lay flat against the wall. I didn’t poly anything and they still look fabulous. For the nutter bars I picked up a 2×12 laid out my spacing and cut the notches across the 12″ face. Then I just ripped the bars 1″ wide out of the 2×12. Went pretty quick and cut down on a lot of repetive measuring. These shelves hold an amazing amount of weight for how simple the structure is. These look great Sean! For what it’s worth I think the darker color goes better with your Dragon sentinels displayed throughout the unit. Did you mix the stain color yourself or did you go with a basic stain color? Good eye sir! It is a 50/50 mix of Red Mahogany and Red Oak Minwax oil based stain. After a few test pieces I liked that it had a richer tone but the same overall redish brown that Red Mahongany dried with. I love Hungarian shelves because they leave the floor underneath free and easy to clean. Alas, my wife doesn’t care for them so you won’t find any in our home. I took advantage of this free-floor feature once when fabricating and installing steel cantilever shelves in a shipping container. They followed the basic form of Hungarian shelves except that the verticals ran from floor to ceiling and were tied into both. It made for some good sturdy shelves that left the floor free to store heavier equipment. How much play do you leave in the verticals to accept the wedge? In all my reading about these kinds of shelves I haven’t seen any explanation as to why the wedges work while making slots that are perfectly sized does not. 7/8″ for 3/4″ nominal shelving worked well with cheap pine shims. Wedges lock the shelves in. There is nothing to lock in place if everything aligns perfectly. Even with a bit of glue, I’d never trust it.